He opened his eyes around 4:30 a.m. in his bed at the Ritz Carlton Hotel and started staring at the ceiling tiles. "Even after all these years, especially that first one, there's some excitement going on,'' Ryan Fitzpatrick said. 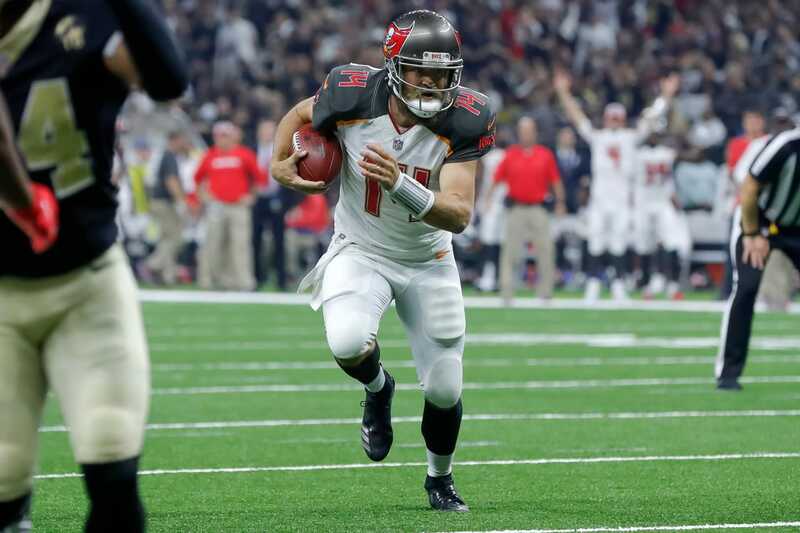 The 35-year-old Fitzpatrick proved he can hang in there with the kids at the Mercedez-Benz Superdome. He had no senior moments during his record-setting performance that led the Bucs to a stunning 48-40 win over the Saints Sunday, tying the club record for the most points ever scored in a game. Fitzpatrick passed for a career-high 417 yards with four touchdowns and ran for another score while out-dueling future Hall of Fame quarterback Drew Brees. "I'd like to announce Fitzmagic is alive and well,'' coach Dirk Koetter said. Indeed it is. Who saw this coming? The gray-bearded, vagabond quarterback with his seventh team taking over for suspended face of the franchise Jameis Winston and leading the Bucs to the biggest upset in the NFL on opening day. Bucs fans seemed to embrace Fitzpatrick before and after Sunday's game. Six fans wore faux beards and red t-shirts that when shoulder to shoulder spelled MAGIC! But what Fitzpatrick did was no illusion. He made the deep ball reappear in the Bucs offense again. And it wasn't just any offense. It was a Tampa Bay offense with the plays called by coordinator Todd Monken instead of Koetter. The biggest bomb to drop for the Bucs Sunday may have been the first. In fact, they never stopped making them. Fitzpatrick targeted nine different receivers and seven caught passes. Jackson, who was held to 50 catches and three touchdowns last season, caught five passes for 146 yards and two touchdowns. Evans finished with seven catches for 147 yards, including a 50-yard bomb when he beat Saints cornerback/nemesis Marshon Lattmore. What Fitzpatrick couldn't do with his arm, he did with his legs. He has more than 2,000 yards rushing in his career, and his ability to know when to flee the pocket is uncanny. He rushed 12 times for 36 yards, but two scampers really changed the game. Fitzpatrick used a play-action fake to Peyton Barber and bootlegged to the right for a 3-yard touchdown run that gave the Bucs a 14-10 lead. Then after Brees rallied the Saints to within one score and a conversion of sending the game to overtime, on third and 11, Fitzpatrick escaped for a 12-yard run and first down to end the game. "That was a big play in the game,'' Fitzpatrick said. "If we don't get that or throw an incompletion to stop the clock, they're going to get the ball back, and so we didn't want to give it to them. We put five of our best guy out there and the matches we liked. I just ended up coming out of the pocket to the left and saw an opening and knew I could get the first down. I took off. That one was pretty satisfying. That truly is like a walkoff. You know at that point the game is over.'' Afterwards, everyone in the Bucs locker room was talking about Fitzpatrick. Just more play time with a bunch of kids.